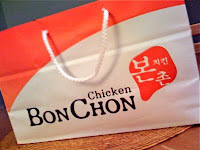 The Beantown Bloggery: Bon Chon is Back!!! Ok, this is the best news I've heard all week? month? extended period of time? According to Bloggery reader Christina, Bon Chon is back! Ever since Privus closed, I'd been going through such serious bon chon withdrawal that I actually went to NYC to get some. This is definitely news worth rejoicing for! Bon Chon is back in business. It hasn’t moved to Harvard Square like everyone said it would. Instead, it’s still located in Allston, a block down from where Privus use to be. Current location is where the restaurant Toki use to be. Lines are mad long too! Ok, I didn't go to NYC just for Bon Chon, I went for job interviews. BUT. I ended up eating an inordinate amount of Bon Chon while I was there. If anyone gets a chance to check it out and snap a few pics before I do, send them over and I'll post them for all to see. 1 Response to "Bon Chon is Back!!!" For those of us who are newbies to the area, does anyone have an exact address of the new spot? The website's location map is horrible.